Stalactites and stalagmites found in caves are an impressive feature of nature but they take a long time to form. Let’s speed up the process by making our own stalactites and stalagmites. With enough time they might even join in the middle and form a column. Fill both jars with hot water. Dissolve as much soda as you can into each one. Place the two jars in a warm place and put the saucer between them. Twist several strands of woolen thread together before dipping the ends into the jars and letting the middle of the thread hang down above the saucer. The ends can be weighed down with various small, heavy objects to keep them in the jars. The two solutions should creep along the thread until they reach the middle and then drip down onto the saucer. Watch what happens to the experiment over then next few days. Don’t forget to wash your hands when you’ve finished. Over a few days the dripping water will leave behind the baking soda, forming a tiny stalactite (which forms from the roof) and stalagmite (which forms from the ground). With enough time these may eventually join to create a single column. 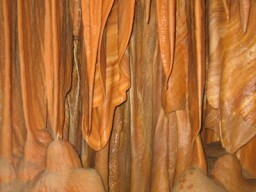 Stalactites and stalagmites are columns of stone which form in underground caves. They are made from minerals dissolved in rainwater that slowly drips from the roofs and walls of caves.